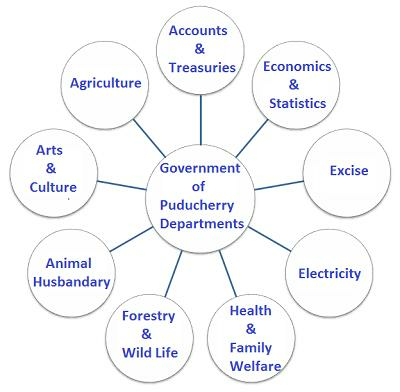 The Government of Puducherry union territory comprises of various departments or directorates that officiate directly under the authorities duly appointed by the Puducherry government. Each of these departments or directorates is headed by a director of a chief who superintends the primary and day to day affairs of the department. Furthermore, the heads of each of the departments are assisted by several appointees like deputy director, Superintendent, senior officer, junior officer and so on. Let's find out the various departments of Government of Puducherry along with their contact details.